← Lame Adventure 71: She’s Baaaaaaaaaaaaack! Greg: The Boss is dead. Me: Don’t be ridiculous. She’s in her office right now with nothing more than a mild red wine hangover. Since I am a Yankees fan, I did feel a twinge of sadness, but I was also aware that he was elderly and ill, so I was neither surprised nor prostrate with grief. I did find the timing symbolic that he bought his rainbow on the day of the All-Star game. Yankee-haters must have been delighted to hear broadcaster Joe Buck announce at the All-Star game’s conclusion that it was dedicated to Steinbrenner, considering that it was coached by Yankee skipper Joe Girardi and the losing pitcher was Yankee Phil Hughes, giving the National League their first All-Star game win since 1996. Had Hughes been the winning pitcher, the media spotlight would have burned even brighter considering the significance of this victory on this day distorting it into yet another Hallmark card-style tribute to The Boss. I knew that Steinbrenner’s death would be a major news story since he was a colorful larger than life personality. Jeopardy! was pre-empted for a half hour tribute special to him on WABC TV. The New York Daily News published a special evening edition, something they last did when President Obama was inaugurated. The New York Times will keep his obituary available on line for months. Steinbrenner has already been praised all out of proportion to an exhausting degree. Countless times I have heard about what a business genius he was for buying the Yankees for $8.7 million in 1973, but what’s $8.7 million worth in 2010 dollars? According to the inflation calculator, that figure would be $44,206,030.59 in today’s dollars. Not exactly chump change. All-Star Game color commentator Tim McCarver claims that Steinbrenner invested $168,000 of his own money in the deal. According to that same inflation calculator, that would be $853,633.69 in 2010 dollars. Obviously Steinbrenner was in the right place at the right time when he made that investment. The team’s estimated worth today is $1.5 billion. To avert Steinbrenner’s threats to move the team, my tax dollars helped pay the billion dollars for the new Yankee Stadium, a sports palace with ticket prices so out of reach I have yet to attend a game. My dear friend and consummate Yankee-hater, Milton, finds the Steinbrenner love-fest stomach turning. He thinks what is being worshipped is not a person at all but what this person represents, the great American dream i.e. phenomenal, unimaginable, unattainable (for almost all of us) wealth. I think Milton has a very good point, and as for all of Steinbrenner’s charitable contributions? He made zillions, why not give some of it away? He turns on the TV, sees someone suffering, feels sorry for them and sends a check. That’s the way it should be. When people regain their senses about Steinbrenner Milton and I doubt that he’s going to be remembered as a great philanthropist. He’ll be remembered as what he was in his heyday, the tyrannical Yankee owner with very deep pockets and a very short fuse, a guy that was obsessed with winning — not baseball’s Gandhi. If we outlive Donald Trump, Milton is certain that the media will glorify his life story beyond belief, too. That will be another good day to have a supply of Rolaids at the ready. 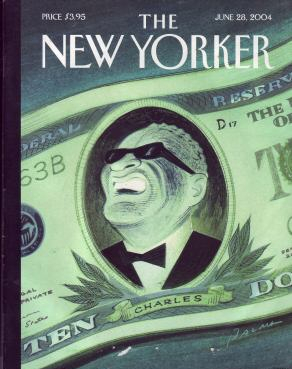 This entry was posted in Humor and tagged george steinbrenner, new york yankees, ray charles, the new yorker. Bookmark the permalink. My fave Yankee owner remains, all due respect to George, Jacob Ruppert – not only did he assemble the greatest team ever, the 1927 Yankees Murderer’s Row with Ruth & Gehrig, and not only did he have the greatest manager in Miller Huggins but he owned a brewery in Manhattan and produced Knickerbocker beer -now that’s my kinda owner! Nancy, I like your take on the Boss’s passing. I was kind of thinking the same way, and I was feeling a bit guilty (but no more, thank you). I found your blog through my cousin Ann and enjoy your writing. I’ll be bookmarking your page.